About 6 months ago or so, some IBMers started what turned out to be a storm of tweets with the hash tag #stuffibmerssay. I as well as over 700 others tweeted our own ideas to this. 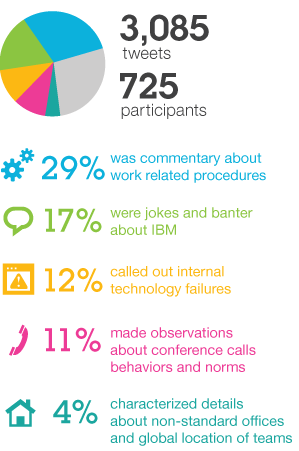 A few non-IBMers were interviewed in addition to the IBMers to gain some insight for the researchers about how Business Partners and customers see and hear IBM, Twitter and the meme. Undoubtedly inside IBM it was viewed from 2 different sides as fun and collaborative for the vast remote users but also dark and not politcially correct by those less in touch with the realities of the world around them. It is not your old IBM, it is very much a new IBM. Happy to see the Research Scientists were allowed to not only follow up on this but presented the findings in a report and presentation recently. The link to the IBM research page is here and Dr. Jennifer Thom's interview at SXSW about it, Data as Narrative, here. Jennifer was helpful in letting us know when this would be live so we could blog about it. I was one of those interviewed and the questions were around the basics of why would we do this, what did we think would or would not happen from it, what we thought IBM saw it as (PR, Marketing, HR benefits, financially, competitive), why it went viral, also asked about the good and bad tweets and our thoughts. As a Business Partner, and prior IBMer, I pointed out that many were a cliche but when you think that a company of 300,000+ people with most working remotely or on the go and you will get the usual conference call references, corporate speak and such. My interest was in the fact that it shows a number of IBMers are being social and using in this case Twitter although no doubt Facebook and Linkedin posts also were out there. What if this ran inside IBM, maybe it did who knows, and how many would do it inside? Would or did the majority of the company post an update or message with their own input? THAT would be really impressive to read about the report. And this happens every day for companies who have already instituted IBM Connections or similar products. This is power. More importantly it is what gels together your company as a family rather than as an Enterprise with no heart or soul for employees to believe. This brings up the culture vs. management discussion around social business products and why people do or do not post to them. True the outside people follow IBM guidelines not to disclose secrets and such but are free to post their alternative and sometimes negative views of the decisions the company makes. Business Partners also do this and the repercusions to those on the inside and those on the outside continues still in various degrees. In order to fully be an open and social enterprise one must be willing to embrace all sides of a discussion. The human race is still far from being purely accepting but if your culture is still a silo, you will not likely be able to have as much fun as we did with #stuffibmerssay. But you know you want to do it, right? So go ahead, your boss is probably not on Twitter anyway, who knows maybe you too will get an IBM Researcher knocking on your door.